Lightweight cycle touring for geologists! 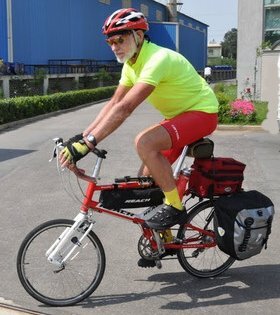 I use my folding bike to go on long distance cycle tours to relieve the mental stress of dealing with minuscule fluid inclusions in mineral deposit studies. Cycle touring is a great way to see the geology as you ride. Well, you can see the geology going uphill, but the screaming downhills are so much fun that you have no time to see the geology! The saga of my touring bikes and changing mountain shifters to road shifters on my folding Reach trail bike. Tips for cycling from Darwin to Adelaide, 3000 Km on the Stuart Highway, central Australia. Central Victoria -Melbourne to Albury and return in a cold, wet and stormy spring. 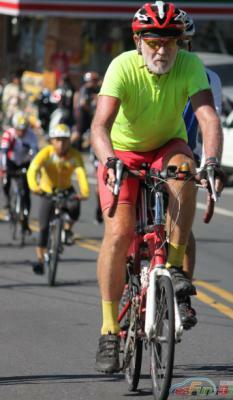 Now most cycle tourists are actually into heavy duty endurance. They have a 20 Kg bike with 50 Kg of baggage - plus their own weight. This is absolutely heroic, but it isn't necessarily fun. My solution is to eliminate all the camping gear and rations and rely instead on finding a hotel of some sort each night, although this can be slightly challenging in a strange country where you cannot speak the language or even read the signs! 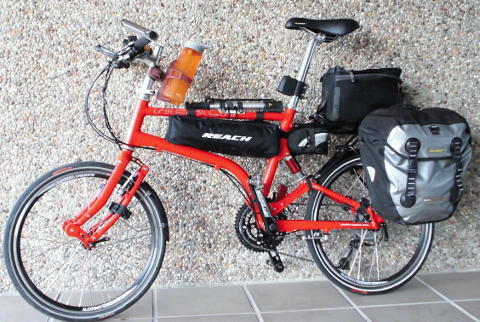 For this lightweight touring I use my nice "Pacific" REACH folding bike which weighs just 10 Kg. Together with 15 Kg of baggage and tools I can enjoy touring rather than pretending to be an endurance elephant. The big advantage of this bike is that it folds up for packing and transport as normal baggage on airlines. With the possible exception of the USA where airlines have a strong aversion to transporting bicycles and discourage it by charging exorbitant baggage fees! But in more rational parts of the world it is easy to transport this bike - even on super-budget airlines! When packed into its carry-bag, this bike travels with me as one standard airline luggage item weighing about 22kg at check-in for no excess charge. (I take the single pannier of clothes as carry-on luggage.) Folding and packing (or re-assembling) the bike takes 45 to 60 minutes. Despite folding, the model of bike I use has almost identical dimensions to a normal road-race bike so it is fun to ride, rather than merely being a necessary inconvenience in order to enjoy the freedom of having your own transport! The bike is made by Pacific Cycles, in Taiwan. And here is my bike, modified with a rear rack and bags for touring. Shown here at the start of a tour of Taiwan in 2011. Note that I only ever use one pannier on the rear, as well as the bag on the top of the rack. Although this would appear to be unbalanced, it is not at all difficult to ride like this. This is the entire luggage for my 3 weeks of self supported touring in Taiwan. No support vehicles required! Sure, the small (20") wheels look odd at first, but they do not negatively affect the ride at all! I still travel just as fast as on a conventional 700c wheel size road bike. And because there is suspension on both the front and rear wheels, it is also a very comfortable bike for long tours! On a day trip up to the Taiwan mountains, I left off the pannier. But you still need your toolkit and somewhere to carry some spare food! This is looking over a reservoir just east of Chiayi in southern Taiwan. Chiayi is a convenient town near the mountains with many interesting routes to cycle nearby. You could stay on the western plains of Taiwan which are completely flat - but that is so boring. The real fun cycling is in the mountains - but don't underestimate these mountains - they are even more serious than the European alps, though they rarely have snow because Taiwan is in the tropics! Taiwan is not the only place I have been cycle touring - but it was one of the most pleasant. Here is a story of my tour. 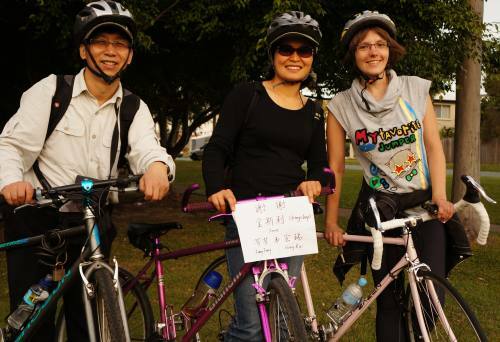 And here are some tips about cycle touring in Taiwan. 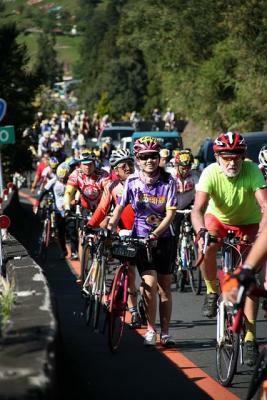 In August 2011 I found an excuse to return to Taiwan again and rode another 1900 Km around the mountains, including an amazing "traffic jam" event with 7000 cyclists riding up to the high pass at 3250m altitude from a start altitude of 500m just 55 Km away. It was another chance to enjoy many more rides in the mountains. Here is a story of my second visit. During the climb eastwards to Wuling summit, the road was often jammed with cyclists walking their bikes because of the steep gradient. And at the end of the day I relaxed with 4 new cycling friends in Tianxiang village within the rugged and beautiful Taroko gorge, before I rode back west over the summit again the next day. And another tour around eastern europe (map) (2010) starting from Switzerland to Austria and Hungary, then Slovakia, Poland, Czechia, Germany and back to Zurich. My story about this tour is here. For great weather, the tour from Brisbane to Cairns (map) (2009) on the Australian east coast was by far the best. Guaranteed sunshine every day! Just head off up the road to an unknown destination and enjoy the ride! 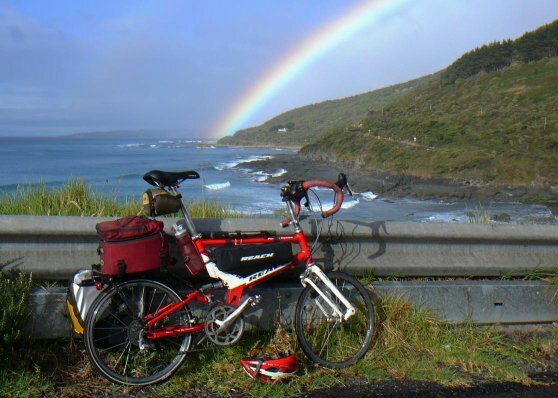 In January 2012, I rode the coastal route 1000 Km from Adelaide to Melbourne, which was an endurance trial with much headwind. But the Great Ocean Road near Apollo Bay is a sublime scenic route that is great for cycling, as seen here. My story and route maps about this adventure is here. In August 2012 I ran a tour for 3 geologists after the IGC meeting in brisbane. 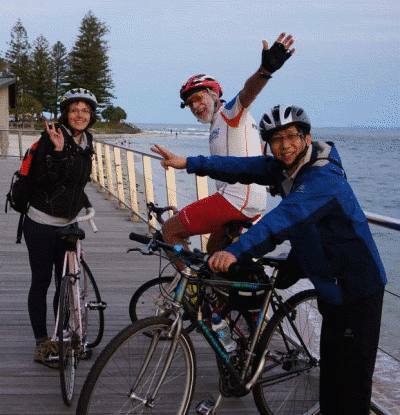 Here, Anastasiya, myself and Hong Rui have arrived at Caloundra on the Sunshine coast, north of Brisbane and also Hong Rui, Fangfang and Anastasiya celebrate their successful cycle ride. This is one of my favourite areas to ride, with many backroads, small towns, beaches and mountains also. And here is my story about this ride. In january 2013 I commenced a ride from Melbourne to Brisbane, but terminated the tour at Canberra due to weather and mechanical problems. Here is my story about the ride and the route map. The route covered 1000 Km in 6 days of touring. In June 2013 I rode 3500 Km around western turkey. An Amazing destination. The story is here. In August 2013 I rode 1800Km around south-central Sweden (Bergslagen). The story is here. I have had to change to flat handlebars. But after 2000 Km of bad roads in China I find that these bars are not as comfortable as the drop bars of my previous bike. (I have subsequently changed to drop handlebars, explained here). But this bike does have a built in rack which folds easily, a great improvement over the add-on rack of the previous bike and folding the bike for transport is now much easier. The story of my first 2014 trip to western china is here. The story of my 2014 trip to Japan and southern china is here.